Pinoy, What’s The Origin of Your Family Name? Around Christmas and New Year, many Filipino families come together for their family reunions. Among the highlights of said reunions are knowing the members of the clan. Maybe, stories will be retold of origins (secret or otherwise) of the clan’s name. Pinoy, have you heard from your “lolo” or “lola” about the story of the origin of your surname? Oftentimes, the curator of Museo Santisima Trinidad has found himself being asked if his family name (Gaerlan) was Spanish, Gaelic/Scottish, French (Guerlain), or maybe, just plain Pinoy. Interesting enough, the rise in popularity of the Azkals have raised the consciousness of Filipinos, not just about football, but also about the question of the Filipino identity rooted in family surnames (Younghusband, Hartmann, Etheridge and histories (pure breed, mixed or otherwise). 1. Using First Name of Parents. Luciano P.R. Santiago, in his beautiful book about the life, art, and times of Damian Domingo (http://www.vibalfoundation.org/?books=the-life-art-and-times-of-damian-domingo) described the practice where the first names (a Chinese custom), instead of the family names, were used to name offsprings across generations. As an example, the name Damian Domingo came from the first names of his father (Domingo Macario) and his mother (Ermenegilda Gabriela). In addition, Santiago listed other examples being “…the Paternos of Santa Cruz in Manila, the De Leons of Bacolor, Pampanga and the Critobals of Lucban in Tayabas” (2010, p.10). Oddly enough, if this was used in the case of this curator, then his full name would have been Rudolfo Catalina. Image: The Life and Times of Damian Domingo. 2. Retaining or Hispanizing the Chinese Names. Many Filipinos trace their roots to Chinese ancestry with Chinese family names that were Hispanized as condition for converting to Christianity (or for other reasons as well). As an example, the “Familia Lacson” from Moro Iloilo trace their family name to the Chinese character representing the sixth son. In fact, the official coat of arms of the Lacson clan shows the Chinese characters for Lacson (see http://familialacson.com/index.html). However, it should be noted that there are families who were able to keep their Chinese names. A very good example of the fruits of a family’s devotion to understanding their roots can be found in the Limjoco clan website (http://limjoco.net/). Family legend of the Limjoco clan traces their origin to a mighty Chinese warlord who tried to invade the Philippines. 3. Being Born or Descended from Spanish Blood. While commentators lament the decline, if not death of the Spanish mestizo, (see Carlos Celdran’s musings on the topic (http://celdrantours.blogspot.com/2006/07/my-writings-on-wall.html, the interest in the history of Spanish descended families in the Philippines continue to be strong especially with the publications on immigrants to the Philippines from the Basque and Galician regions of Spain (see https://curatormuseo.wordpress.com/2011/12/21/the-untold-story-of-the-catalans-in-philippine-history/). As an example, in his book, Basques in the Philippines, Marciano R. de Borja, listed some of the more famous Basque family descended names (Aboitiz, Ayala, Elizalde, Eizmendi, Loinaz, Loyzaga (yes, of the basketball fame), Larranaga, Inchusti, Garriz, Itturralde, Uriate, Ynchausti, etc.). The town of Carcar in Cebu boasts of a very interesting and well done website that deals with family history and heritage. Examples of families descended from Spain are the following: del Corro, Fortich, Barredo, Rodriguez, (http://carcarfamilies.wordpress.com/2011/08/10/the-mestizo-espanol-families-of-carcar/). The Leano clan traced their branch of DE LEAÑO family in San Roman, Santander, Cantabria Spain, from one JUAN ANGEL DE LEAÑO who arrived in the Philippines in 1565 and married a native of Tingguian tribe Princess Maria Bubuisan. ( see http://leanoclan.com/1801.html). The Obias clan of San Jose, Naga, traced their roots possibly to Mexico due to the Manila-Acapulco Galleon Trade (http://obias.wordpress.com/2007/03/23/roots/). The modern day Filipino seeking to understand his/her family roots will inevitably come across the story of how in 1849, the then Governor and Captain General Narciso Claveria y Zaldua, issued a decree and released an accompanying “Catalogo Alfabetico de Apellidos.” Town officials were expected to assign surnames taken from the catalog to every town in their jurisdiction. As an example, Domingo Abella, former director of the National Archives of the Philippines, described how “…in the Bikol region, the entire alpahbet is laid out like a garland over the provinces of Albay, Sorsogon, and Catanduanes. Beginning with letter A at the provincial capital, the letters B and C mark the towns along the coast beyond Tabaco to Tiwi.” We return and trace along the coast of Sorsogon the letters E to L; then starting down the Iraya Valley finish the alphabet…“(1973, vii). As an example, the Serrano clan from Lobon, Albay, trace their family name to the Claveria decree (see their website at http://amingangkan.com/2006/07/10/the-serrano-family/). Another clan from Sorsogon, the Gacias, concluded that their family name was assigned to them as per the Claveria decree (http://gaciasclan.blogspot.com/2008/12/gacias-historical-background-first-part.html). 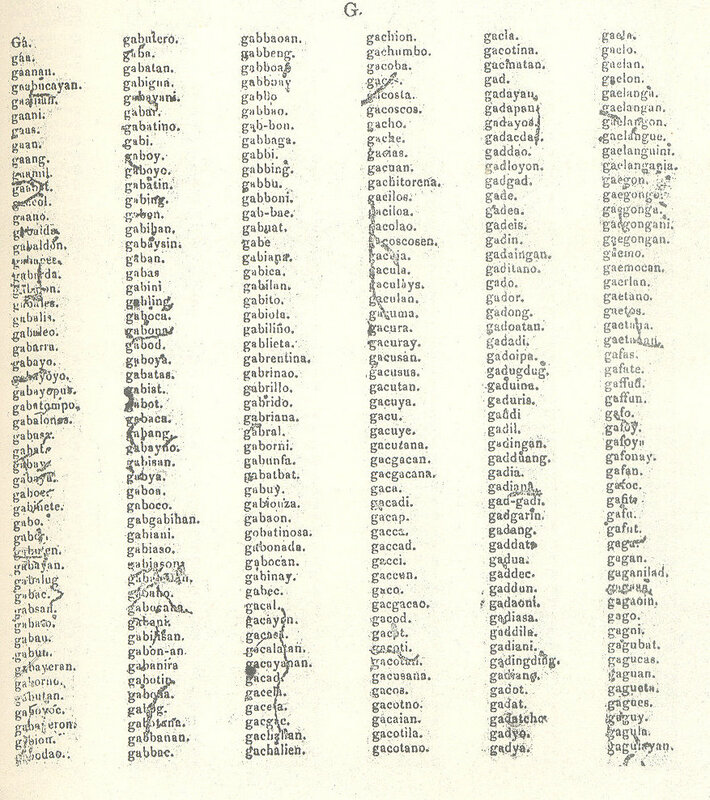 An examination of the “Catalogo Alfabetico de Apellidos” showed that the name Serrano is in the catalog (p.119, column 2). However, there is no Gacias in the catalog although there is a “gacia” (p. 51, column 5). While the Claveria decree seem to direct the town officials to assign names from the catalogo to the towns in their control, the question remains as to the extent to which individual families were allowed to choose their own names within the “letter” assigned to their town. “During the Spanish times, several generations past, the Ygarta family were known to be well-mannered and respected members of the community. However, they were equally known to exact retribution once they were wronged or maltreated in any way. One day, an incident occurred that involved an ancestor of this clan who was then the “hepe” (chief of police) in Sinait, Ilocos Sur. A rich man by the name of Don Manuel met up with the said Ygarta gentleman in a local cantina (canteen). Don Manuel started berating and belittling him. The Ygarta gentleman remained unperturbed and did not rise to the bait, but Don Manuel kept on with his tirade. Thus, to prevent future generations from the curse of this Ygarta gentleman, the family chose the name Tangonan. According to Sabas Gaerlan, in his Ilocano memoir “Casuratan Ti biagco, Sinurat ni Don Sabas Gaerlan” translated in English by Jane G. Guerrero and published in 2009 (see https://curatormuseo.wordpress.com/2011/12/24/bibliographic-history-of-sabas-gaerlans-diary-born-dec-5-1854-tagudin-ilocos-sur/), the origins of the Gaerlan name can be traced back to the Claveria decree. “At that time (during the Spanish Occupation) an order was issued by the highest authority of the Philippines to the effect that families bearing similar surnames have to cease using them and to change these surnames accordingly. Because of this order, the San Juan and Tagudin families agreed to adapt the surname Gaerlan” (2009, p.133). 5. Retaining Pre-Claveria Names of Pre-colonial Ruling Native Families. According to Prof. Luis Camara Dery, surnames like “Lakandula, Soliman, Punslang, Makapagal, Gatdula, Gatpolintan, Gatbonton, Gatbondok, Gatmaytan, Sunga, Salonga, Dumandan, Talampas, Yambao, Nuguid, Pagoyo, etc.,..” descended from these pre-colonial ruling families (Iisang-Dugo: Kinship and the Origin of the Filipino People, pp. 1-20 in A History of the Inarticulate, 2001, New Day Publishers). This curator completed his secondary studies at Cainta, Rizal where some his classmates were descendants of the Sepoys who remained in the Philippines after the withdrawal of the British from the Philippines. In would be interesting to find out how the present descendants of these Indian Sepoys carried the names of their ancestors. National Archives of the Philippines (1973). Catalogo Alfabetico de Apellidos. Family Search (https://www.familysearch.org/). This curator prefers using the newer search engine of Family Search. Clicking on the Asia and Middle East option will show the available records for the Philippines including around 6,197,955 online images of births, marriages, and deaths for the City of Manila (1899-1994). ~ by Martin Gaerlan on December 29, 2011. Saan po makikita ang Catálogo alfabético de apellidos? Abedania, please look for it. Try to contact the National Library. I got my copy there in the mid 70.
can you find covarrubias, abejuela, miramontes for me? thanks. Cobarrubias with a B not a V is included. so abuejuela is listed, abejuela is not? Enrique is not listed in the catalogo. the closest is Enricoso. hello po this is a very interesting post. is the family names Rosario and Madrid included in the decree?? thank you! Madrid is included (page 80). Rosario is included but note that the complete phrase is “rosario (a) salinas (page 113). can you give me a copy of the book? the spanish influence will be my topic for my lesson, and i want to tackle that topic. thank you. There is no Fonollera in the catalogo. The closest is a “Fonolle?as” where the third letter to the last is unreadable. If it was an “r” then it would have read as a Fonolleras. Nice post. I’ve been trying to find a copy of the book too. Can you check if there is a Pelletero/Pellitero on the list? Can you please check if there’s a Reclusado/Recolizado, Temporal and Moldez? Temporal is found in page 129, column 2. Moldes with an s and not a z is found in page 87 column 3. Can you please check for the last name Licarte? I am having a hard time finding its origin. Thank you! Do you mind posting a picture of page 75 so I can try to see if the name “Licarte” is there? Jon, there is no Aucena. the closest is “ausencia” on page 9, column 5. Can i ask for a favor? Is Solima and Oraiz listed? Thnks! There is no Soliman and Oraiz in the catalogo. No Barrientos but there is “Barrietos” (p.15 column 1). there is a LIGA, page 75, column 4. There is no Fernandez. There is no Palmeras. The closet is a Palmero. Is Ricamora as surname of chinese descent? Hello. We have this paper for school that requires us to find the history of our family name. I’ve been looking for help until I have found this. May I know if the surname Cabalo and Emvile are listed in the Catalogo? Thanks. Sorry, both Cabalo and Emvile are NOT listed in the catalogo. Ricamora is listed in the catalogo, page 110, column 6. How about Brillantes, Lopez, Collado and Albayalde? Thanks. Is Arzaga in the book?. My ancestor Florencio Arzaga married Maria Ballesteros, and lived in Dingras, Ilocos Norte through at least the 1920s. In a photo from 1921, he appears to be about 70. I’ve been looking for a copy (even if institutional) of this book for years, but the nearest one is in a library 500 miles away. Could you tell me if the names Moya and Cariaga (with one or two rs) are listed? If a name is *not* listed, was the arbitrary assignment of Spanish surnames common practice outside of the Claveria’s decree? If a name is known to be assigned via the decree, do records typically exist of the first family to assume that name and, if so, is it possible to trace a line much farther back in time than 1849? Daen and Daeo are not found. Wow! Thanks for the reply and information! One last, Sir. How about Daep? camero seems to be included (the last letter is not the legible in the copy of the book that I have (p.26 column 4). Danganan is not listed although the closed name is danga (p. 36 column 6). hi sir,i just want to know if their is ferolino surnames listed in the book? Yes, Ferolino is found, page 49, column 2. Borromeo is on the list, page 20, column 3. and Castro, page 29 column 4. Neri is on page 91 column 1. Hello Sir, would you please look to see if Cambaliza/Cambalisa is listed? Our relatives use cabajar and Kabahar as family names. I wonder which one came first or is either one listed in the book. Is the last name “Llanes” listed in the catalog? Sir, is the last name “Vecina” listed in the catalogo? Thanks! Is Amadeo included in the list of surnames? My surname is Eusebio. We’re from Los Banos, Laguna. Was the surname just freely assigned by Claveria to various provinces in such a way that the Eusebio’s of Los Banos and Bulacan are not necessarily related? The actual implementation varies depending on local government officials. Bicol is famous as the government decided what letters will be assigned to specific places. However, it is possible that families from other provinces could have been assigned (or chosen) similar names. Best approach is to conduct proper ancestral tracing via birth/death certificates, etc. Hi! Is Faeldon found in the list? Thanks a million! My ancestors original family name from Narvacan Ilocos Sur was Dy and they changed it later to Zulueta. Does zulueta is included on the list? And how about Hagad? I’m so glad to find this site and that you are offering to let us know if our family names are in this (very hard to find) book. I really appreciate it. I know it’s a lot, but if you don’t mind letting me know if these surnames are in the catálogo and where they are in the book. My surname is Eusebio, from Los Banos, Laguna. The oldest baptismal record I found of my ancestors is that of Monico Eusebio, dated April 1, 1831. How come we already had that Spanish surname even before the 1848 Claveria decree hispanizing Filipino names? 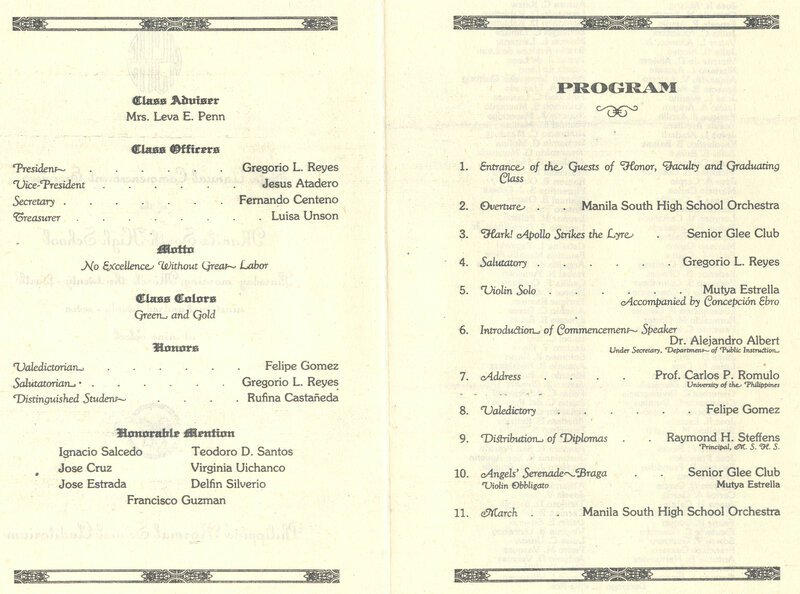 Also I have a copy of the Catalogo of Claveria, but the surname Eusebio is not listed. Why so? Thanks in advance for your reply! Well, there are really some catalogo names which were already existing even before the publication in 1848. Follow-up. The parents of Monico Eusebio (1831) are identified in the baptismal record of Los Banos, Laguna as Don Thomas Eusebio and Dona Juana Bulactala. They must have been born around 1810 or even earlier. From an article by Prof. Luis Dery that I read, the Bulactala’s are descendants of Rajah Matanda of Manila. In fact, the daughter daw of Rajah Matanda was Dona Maria Bulactala. Also Rajah Lakandula’s great great granddaughter was named Dona Luisa Mandig Bulactala. Bulactala is the corrupted form of the phrase “bulaclac ng tala” which literally means “beauty of the dawn”. You now need to trace back even further than 1831 for documentary sources to show the link. I have been doing research on the Cadelina (n is “enye” but I could not type it in my laptop) Family of Bacarra, Ilocos Norte and the migration of many descendants to the fertile valley of Isabela. I have listed around 1,500 names in the website http://www.cadelinafamily.tribalpages.com. Imagine my surprise when I realized that in the late 1800s there were also big clans with the same surname in Lucban, Quezon and in Jagna, Bohol. I was trying to find a connection, a common ancestry but I realized after reading your post that the more plausible explanation is that separate clans chose the same surname in response to the decree by the Spanish General. I The same pattern appeared for the Visaya family (my dad’s mother side). Same surnames for people separated by great distances. If you have a copy of the Catalogo Apellidos, are both surnames listed? Thanks a lot, Is the surname Visaya also listed? yes, visaya is listd, page 137, column 3. As what I heard from my grandfather our surname was change to Apa during ww2 when the japanese colonise the island of mactan cebu they don’t gave them their real surname that’s why you can heard a lot of funny surnames here in mactan is it possible? Yes, it is possible. 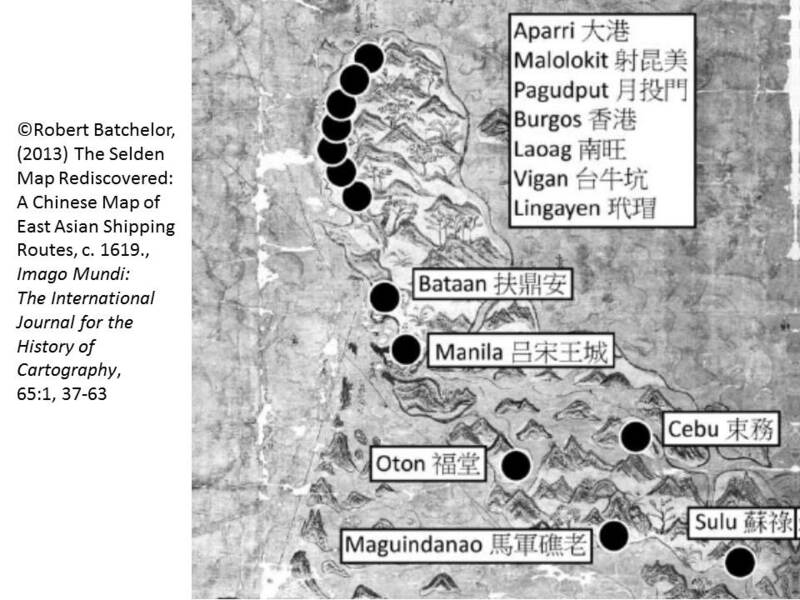 The Chinese filipinized their names to avoid harassment and persecution during the Spanish period. So, it could be used as say strategy. hi sir. kindly check if Varela, Dollano, Carbacillas & Porras were included. thank you so much. Carbacillas & Dollano is not included. Porras is included, page 105, column 1.
hi, can you check the following surnames: alitin (aletin), bunao, & duque? i believe they are from baguio, pangasinan or tarlac area. thank you. Altin is not included. Bunao not included. Dues is included, page 42 column 3. Hello, is Enriquez or Liquido included in the list? Thank you! hello po. i am from iloilo and my family name is mallorca. meron pa ba sa list nyo sir. ngaun po meron na rn ako. peregrino po family name. pwede po bang ma chek na rn. thank you po sir. hello po. i am from iloilo and my family name is mallorca. meron pa ba sa list nyo sir. ngaun po married na rn ako. peregrino po family name. pwede po bang ma chek na rn. thank you po sir. No, Mallorca is not included. Peregrin, without the “o” is included, page 103, column 1.
mine’s Ordonez. with an enye. I’m really, really curious! yes, Ordonez, page 97, column 5. Mine’s LOORLUIS Sir,Is it included in the book? Sorry, Loorlus is not in the book. i want to know about the history of Diaz Family in Negros occidental. Can you help me please? Thank you so much in advance. Diaz is found in page 38, column 6. Will you please look after the family names of De la Cruz; Diaz and Mesario. Diaz is found in page 38, column 6. the entries for MEsario can’t be read, the words are not legible in the copy – book so we can’t say. A very belated thanks for informing me that Cabajar is in the Claveria list of surnames but surprised that Kabahar is not although the latter is spelled with the letters of the Pilipino alphabet. My relative, a famous Piux Kabahar was credited with changing the Cabajar to Kabahar around WWII to express his patriotism. Neither Cabajar nor Kabahar have no existing meaning. Is it possible that both may have evolved from other words or phrases. For example, Kabar means news in Malay but is Arabic in origin. Is it possible that one who was assigned to gather names for the Claveria list or for a prior catalogue list that Kabahar might have been entered in the catalogue but was spelled possibly with the letters of the Spanish alphabet ? Your expert comments will be very much appreciated. How about Castellano? Was it included in the book? S0orry Castellano is not in the catalogo. Does it shows that Castellano is an original Spanish surname? According to what I have heard the origin of surname Castellano came from people who migrated in the Philippines from Spain. No, the book does not tell you if your surname is Spanish in origin. It could be be that Castellano is Spanish in origin. However, the only to validate this claim is by using church or civil records (birth, marriage, baptism, death, etc.) to trace back ancestry. How about the Canonigo surname? Do you have an idea about the Varilla surnames? I’ve been searching for it for quite sometime and find it hard to see any documentation if the surname is just adapted or if it is the true surname of my ancestors. Varilla can be found in page 135 column 3 of the catalogo. hi can you please check if feliciano is included in the list? Thank you! There is no Feliciano. The closest is Felicia (p. 48, column 6). Hi how about PALENTINOS? Im a descendant of Don Eulalio Palentinos and Doña Agatona Lope-Palentinos. People with surname Palentinos are very common in the province of Laguna. So could you check for me if this surname is included in Claveria’s book of surnames? Thank you! I’, sorry, there is no Palentinos. Hello! Can you find Nacor, Sendico, Balane, Baylon, Luar, Balimbing, Remuto, and Velarde. That’s the surnames and middle names of my four grandparents. Thank you! Balane= none; baylon = none; Luar = none; nacor = none; remuto = none = sendico= none. sorry. Ang “Balane” ay isang orihinal na Pilipinong ngalang-ankan na ibigsbihin ay “Magnetism” sa wikang ingles. Hi, Sir. Good day! Can you look for the surnames Reforsado, Baile and Magistrado? Thank you very much. baile = page 11, column 5; Magistrado – none; Reforsado = page 109, column 3. Tnx. Mr. Gaerlan. At least that part of my curiosity is answered. Time to look for more answers to my questions. Mr. Vitug. Hi Mr. Gaerlan. Thank you for this post. Could you please check Fuentes and Guerrero? Thank you. Yes, it is not a rare surname thus very difficult to trace ancestry unless you have already the Spanish colonial period civil documents with you that contains your ancestors name. Unfortunately, it impossible since I could even barely get a birth certificate of my grandparents. My family hails from some of the most devastated area in Northern Luzon in WW2. Jenny, sorry. Arandia is found in the catalogo, page 8, column 1. Okay thanks. I guess it wasnt as popular pick back then compared to other surnames. I was wondering though, how did they get the natives to pick a surname given that at that time illiteracy would be rather high among the natives and literacy rate being limited to the very small upperclass? Would it not be a possibility that surnames would rather be “assigned” than chosen by the people? Maari po bang mag tanong? Nakalista po ba sa catalogo ang apelyidong “Bien”? There is no Bien. Only Bienvenga and Bienvenida. Strange… It’s a Spanish word and yet it does not appear in the catalog. Anyway, thanks for the reply. By the way, may I ask where you acquired a copy of the catalog? Just as an additional reference for my own research about my own family. Hello po. Is the surname Antonio listed? Btw I’m from Cainta, Rizal since birth and I believe that some of my ancestors were sepoys, mukha daw akong Indian. Some of the dominant surnames that i know who are descendants of sepoys are Fernandez, Cruz, Diaz, and Gonzaga, i know there are others but i’m not sure. Antonio is not listed. I doubt if your family name, as well as of Fernandez, cruz, Diaz, Gonzaga, even if Indian Sepoy descent are actually Sepoy names. Most probably, and this is a guess, they acquired Filipino sounding names in order to protect or integrate themselves. However, it is certainly interesting to trace your Sepoy roots but you would have to go to original church records. Unfortunately, Ithink most of Cainta’s Spanish era church records were burned or destroyed. Thank you for your reply sir! Maybe Antonio came from the first name of our ancestor, like what was mentioned above in this blog. Also if i remember it right, Cainta’s old church and even our old municipal hall were both destroyed by fire. Hi sir! Could you look for surname Quilang? Thanks in advance! Yes, Quilang can be found at page 106, column 4. Reblogged this on Isang Bote ng Margarita. Hi good day! Can you find Aguja, Aruta, and Echevarria? Would you by any chance happen to know as well where they were located? I have been curious of my ancestry and have only little information. My parents can only recall up to their grandparents. My paternal grandmother was orphaned as a child. a Thank you for your help! Good day sir! Is Vergara included in the Decree? From Mexico, Pampanga po ako. Prominent family daw po dati sa Mexico iyon. Thanks in advance!! Hello Sir, I was hoping you could tell me if there is reference to the following surnames from Negros Occ. Bacolod and Iloilo: Yogore, Garcia, Ylores, and Zaldarriaga . From Camarines Norte and Sorsogon: Guerrero, Tanyag, Barilla and Diaz. Maraming Salamat Po. Are you related to all of these names? Yes. I am, related to all of them. No Yogore, No Ylores. We cant determine if there is no Tanyag as some of the entries are blurred. barili is at page 14, column 6. diaz at page 38 column 6. guerrero at gage 60 column 5.garcia page 54 column 1. zaldariagga is not sure as the text is blurred. yes, there is a ricafort, page 110, column 6. Good day Señor Martin, would you kindly search for Gijan, Baradillo, Codilla, Impas and Valiente in the Catalogo? Many thanks. Is Jauregui in the list? Sir, is Margarita and Bartolome included among the surnames in the Catalogo? I am a descendant of the Diaz clan of Paoay and Aringay. Thanks so much in advance for your reply. Listed po ba sa catalogo ang Dawis,Culis & Corachea?Thank you po!!! There is no Dawis, closest is daius. there is no Culis, closest is culi. No corachea. No, Agana and acueza is not listed. sir kindly check my surname MOINA? Hi, I’m doing a research on my paternal grandmother’s ancestry. Is the surname “Insigne” or “Ynsigne” included in the list? Thanks. Hi po. Is montejo part of the decree? My last name is “LEAÑO” does it mean i have a Spanish descent?? I would really like to know why my last name [Lauzon] can be found in the Philippines when it is of French — from France — origin..?! How about CASAS and LEBAJAN? Hello Mr. Gaerlan, may I ask if the surnames “Jauregui” “Pascasio” and “Almalvez” are in your book? Thank you very much. Pinoy, What's The Origin of Your Family Name? I Write as I Write: history. and stuff. Holy Trinity Church Washington D.C.